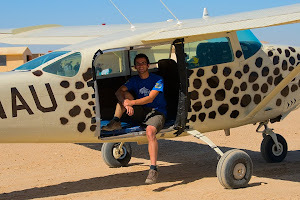 Monday we drove three hours from Spitzkoppe to Namibia's coastal adrenaline center of Swakopmund, where the much-anticipated skydive was to take place that day! 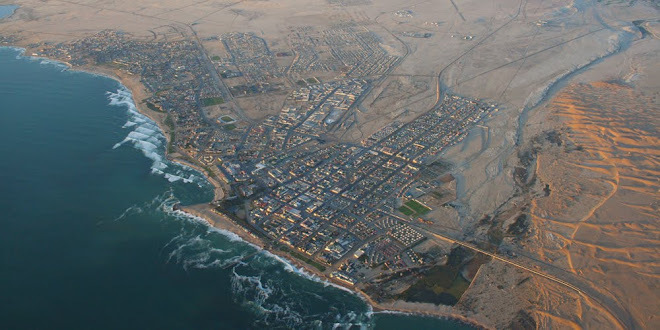 Namibia was a German colony, and Swakopmund could just as easily be a town in Germany, were it not for the sand dunes along the desolate coastline. This is easily the most developed town I have seen anywhere in Africa so far, and its streets are packed with German cafés, fancy restaurants, bookshops, and small boutiques. After checking into our hostel – no camping here! 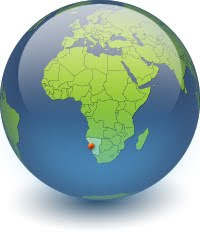 – the first order of business was to visit the KFC, the first American fast food chain I've seen in Africa – I haven't even seen a McDonald's yet! I never eat at KFC at home, but it was great to finally enjoy some good quality chicken, which can sometimes be a rarity in Africa. After lunch, those of us who were skydiving had to hurry over to Ground Rush Adventures and fill out our paperwork. After signing our lives away, we piled in a jeep and headed to the vast, flat desert outside of town. 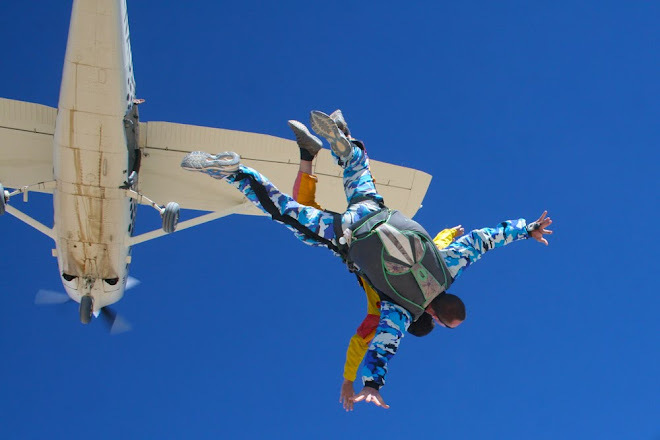 After a short briefing on what to expect when tandem skydiving, they called the first pair – Mark and Ben – to get fitted into their jumpsuits and harnesses. Two jumpers at a time go in the plane, each with an instructor who will take care of all the technical aspects of the jump. The jumpers were soon suited up and ready to go, and they walked the long walk to the small plane. It takes twenty minutes of a spiraled ascent to reach 10,000 feet. Once the plane is positioned directly over the landing zone, the pilot slows the engines a bit and tilts the nose of the plane upwards slightly – the plane is only a silvery speck at that altitude when viewed from the ground. When we heard the sound of the engines change, we knew to start looking for the jumpers. The first one appeared as a dark dot flying silently in a straight line behind the plane. The second jumper appeared a few seconds later. The dots slowly grew a bit larger, and the parachutes opened about halfway down. They seemed to spring upwards a long distance when the air filled the parachutes. Gliding gracefully towards the Earth, they spiraled every once in a while to speed the descent. 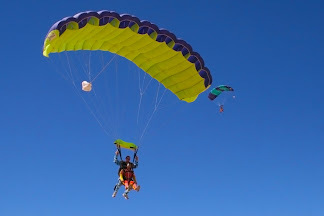 When they were ready to land, the jumper would lift his legs and the instructor would touch down, aided by several helpers on the ground to slow the pair down. 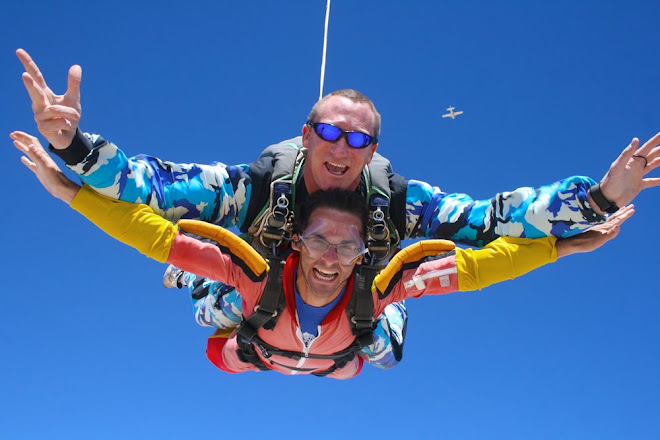 The whole thing looked so graceful and silent when viewed from the ground, but I was growing more nervous as the time for my jump neared, even though both Mark and Ben said the experience was fantastic. The order of the jumpers was unknown to us, so every time they prepared to call the next pair, I experienced a surge of both nervousness and excitement. Maia and Anna were called next. The wind had been picking up all day, and there was now a blanket of sand blowing across the chilly desert. After Maia and Anna landed, the instructors notified us that it was too windy to land safely. The skydiving was canceled until tomorrow for the rest of us! It was a cruel and disappointing turn of events, as we were all mentally prepared for the excitement of jumping. We had the rest of the afternoon to walk around Swakopmund as we tried to forget the long wait we now had until tomorrow. Skydiving day finally arrived, and the weather outside looked perfect. We went out to the desert one more time and proceeded with the day's events. With each jump taking half an hour or more, and only two people jumping at a time, it turned into a half-day affair. I was paired with Beth, and we were the next-to-last jumpers. I had watched enough jumps that my nerves had subsided and all I felt was pure excitement and anticipation. I was fitted into my suit and harness, and I walked with my instructor to the plane. Beth and I, along with our two instructors, two videographers, and the pilot, crammed into the tiny plane. There was no door on the side, so I was able to have a beautiful view of the sand dunes and the Atlantic coast as we ascended to 10,000 feet. When we were nearly there, my instructor hooked my harness to his. It was the point of no return. I heard the sound of the plane's engine change, and I had a brief knot in my stomach as I knew there were only seconds left until I was falling from that plane. My instructor scooted us to the edge, with my feet hanging out of the plane. He told me to lean my head back and cross my arms, and before my brain could process what was happening, I was falling toward the Earth almost two miles below me! It did not feel like falling, and it was not as terrifying as bungee jumping. After all, the instructor jumps for you – there is no time to think about it. The height is so great that you can't even register it – the ground just looks like a map. 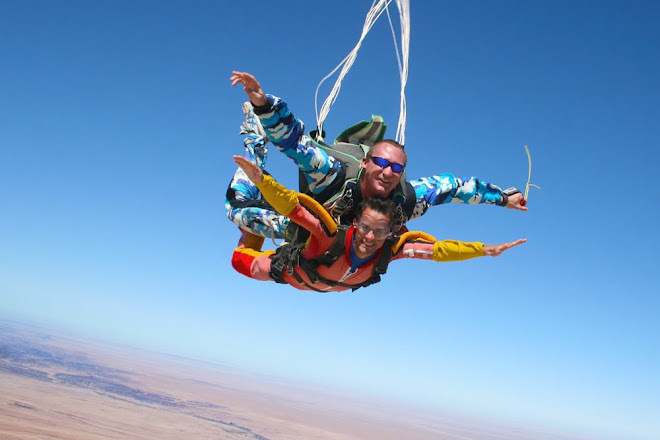 The free fall lasts for about mile, but the ground seems to close in very slowly, so the experience is more like flying. The instructor positioned my arms out to my side, and I flapped them like I was flying. The intense force of the wind made everything seem like it was occurring in hyper-motion. 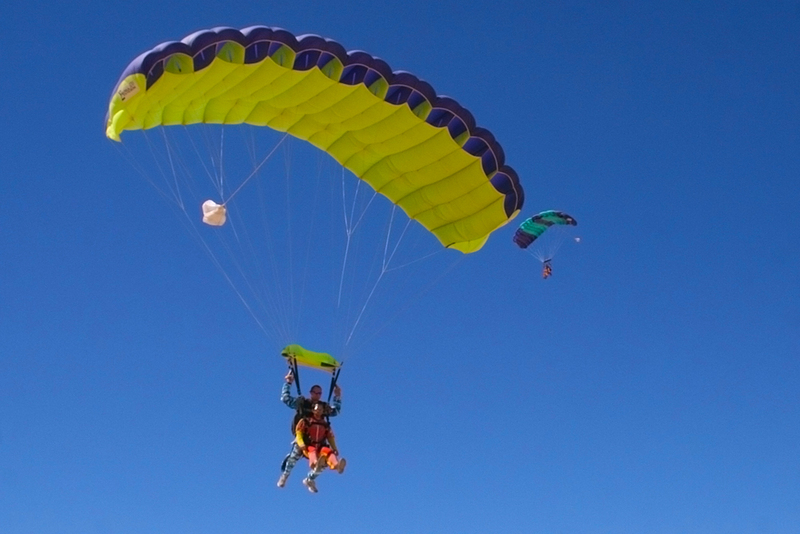 After only minutes, we had fallen a mile toward the desert below us, and my instructor opened our parachute. We shot upwards with great force – the hurricane wind and all the intense motion suddenly stopped, and everything was calm. The pressure that had built in my ears during the fall was so extreme that it was escaping from my ears on its own with a high-pitched squeal, like air escaping from the stretched opening of a balloon. I cleared my ears a few times, and I could soon hear again. My instructor handed me the controls of the parachute and told me to pull down hard on one side. 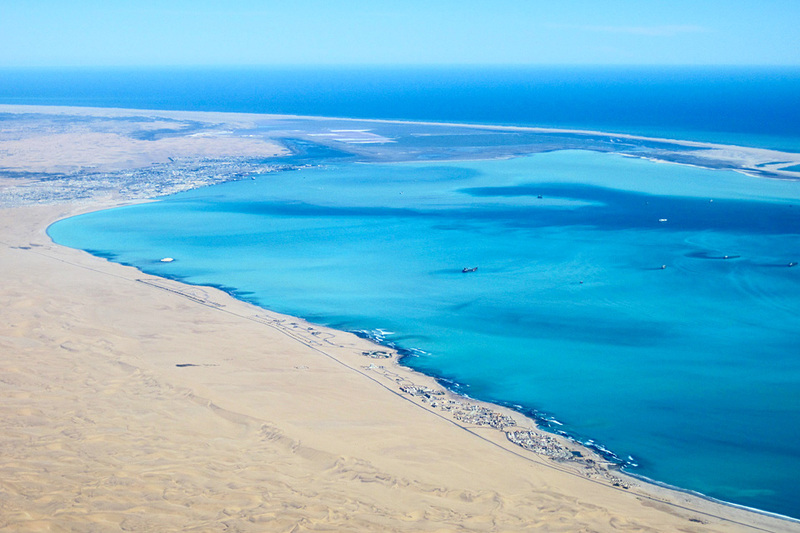 We spun around and around, spiraling downward – ocean and desert blended into one. I was starting to become queasy, so I stopped spinning and enjoyed the rest of the glide to Earth. I took the rest of the day easy. In the evening, I went with a few others to dinner at a Thai restaurant. They were taking forever, and we were about to be late for Shutter Island, which we had planned on seeing at the nearby movie theater. We asked them if we could have our food to go, and we rushed over to the theater. This was the first movie theater I've seen since I was in Dubai two months ago, and I was excited since I'm a movie buff. There was one guy working at the ticket counter, and no one else seemed to be there – there were only two screens. We sorted out our Thai take-away on the table in the lobby and ate it while we watched the movie – that could never happen in the States! 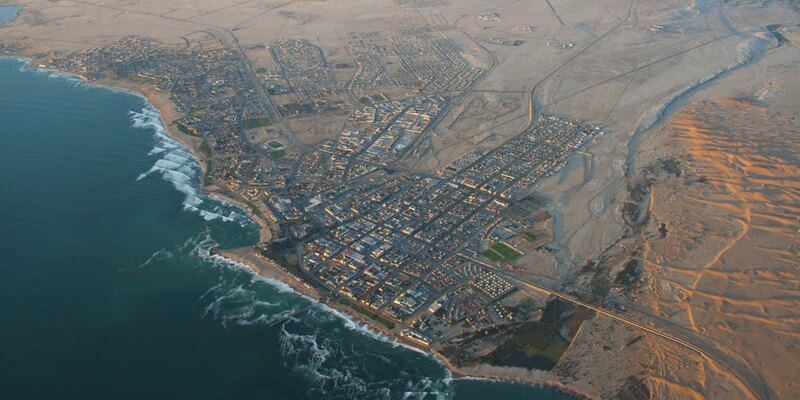 Today was another relaxing day in Swakopmund full of good meals and a bit of civilization. I made the most of it since tomorrow it's back to the tent. I went with Tom and Jude to a German café for a fantastic breakfast – tea, scrambled eggs, pork sausage, bacon, mushrooms, tomatoes, and banana honey pancakes. I walked around town for a bit before having a springbok steak burger for lunch. Afterward, we walked down to the beach, but it was chilly and overcast. We haggled with some of the hawkers who were selling curios nearby and then walked to another café where I enjoyed some carrot cake and hot chocolate. I spent a few hours shopping and catching up on emails before walking back to the hostel to meet some others for dinner. 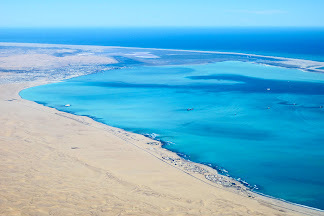 We went to a delightful seafood restaurant that proved to be the perfect finale for Swakopmund. It was Ground Rush Adventures. Hope you have an awesome trip!